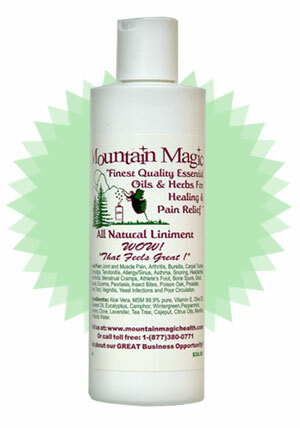 Mountain Magic All Natural Liniment contains an unprecedented 12 top quality organic Essential Oils...Eucalyptus, Camphor, Cajeput, Citrus oils (lemon & Orange), Wintergreen, Peppermint, Rosemary, Clove, Lavender, Tea Tree & Menthol in the carrier oils of Olive and Grape seed. It also includes 9 other plant extracts (Arnica, Aloe, Calendula, Chamomile, Comfrey, Cucumber, Menthol, & Shea) including the best MSM available (99.9% pure). 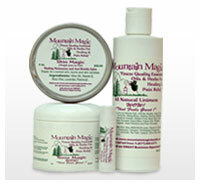 Mountain Magic Liniment contains no petroleum, or animal products. Aches & Pains, Acne, Allergies, Arthritis (when combined with Bone Magic), Asthma, Athlete’s Foot, Bone Spurs (together with Bone Magic), Bronchitis, Joint Pain, Menstrual Cramps, Migraines, Poor Circulation, Prostate, Psoriasis, Rosacea, Shingles, Sinus Problems, Sore Throat, Snoring, Tendonitis, Urinary Tract Infections, Vaginitis, Warts and Yeast Infections. How do these Essential Oils Heal or Relieve? The molecules of these Essential Oils are so small that they instantly penetrate all tissue getting right on into the Nervous System, the Blood Stream, the Joints, and even stimulate the Lymph System to remove toxins from the treated area. Certain parts of the oils called "Cenoles" deaden the nerves, while other oil elements stimulate increased circulation thus delivering more oxygen and releasing your body's own natural pain relievers to that same treated area. I have Fibromyalgia. Therefore I suffer from many different pains and Mountain Magic has made such a difference in the way I feel! I also have sinus issues and MM really clears that all up too! I had an upper respiratory infection that went away in only 4 days!! It usually take me over 2 weeks to get rid of one! Thanks so much!